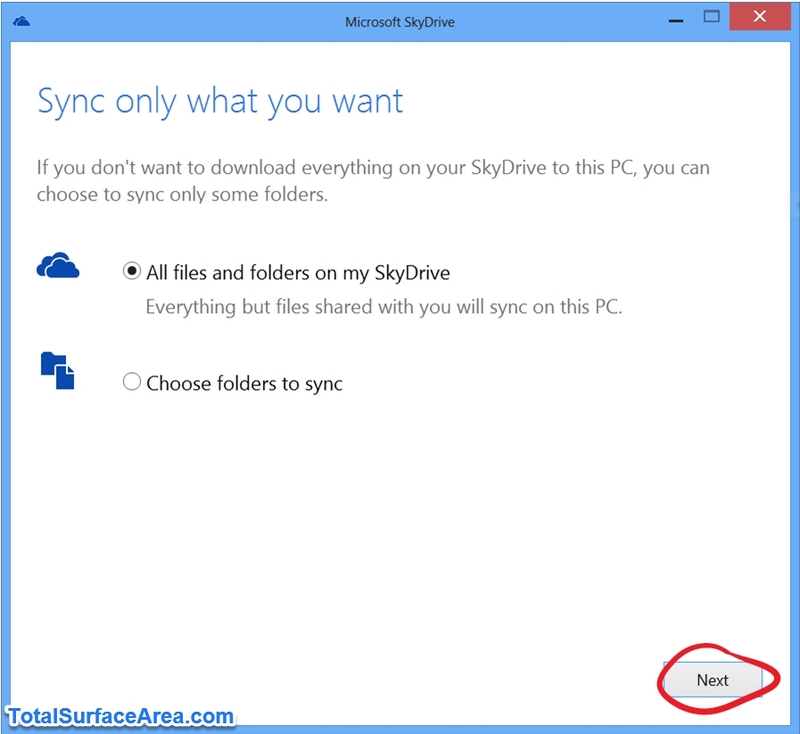 Update: I have updated this post for OneDrive and Windows 10 here. 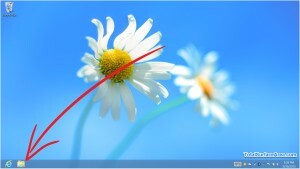 Microsoft’s SkyDrive is great, especially if you use the SkyDrive desktop application for your PC. It synchronizes all your files to your computer so you will always have a local copy to use offline. This is perfect for a mobile device like the Microsoft Surface Pro. However, with 25 GB of storage on my SkyDrive account and less than 20 GB of free space on my 64GB version Surface Pro, I did not have enough space for all my SkyDrive data on the Surface itself. 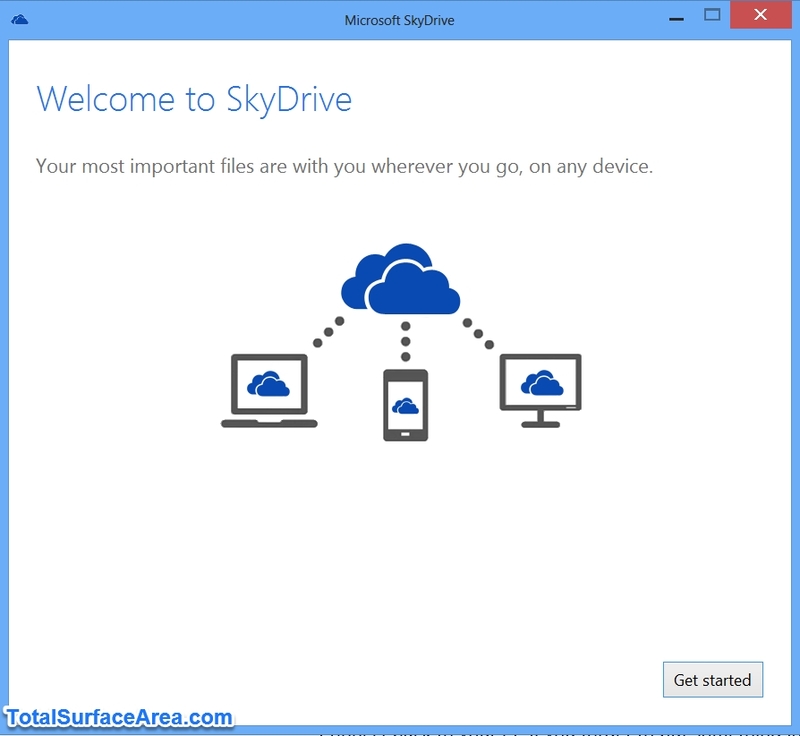 If you have the 128 GB Surface Pro, or have sufficient space for your SkyDrive data, you may still want to sync SkyDrive to a micro SD card to save valuable, and faster, disk space on the Surface for applications. Do not worry. 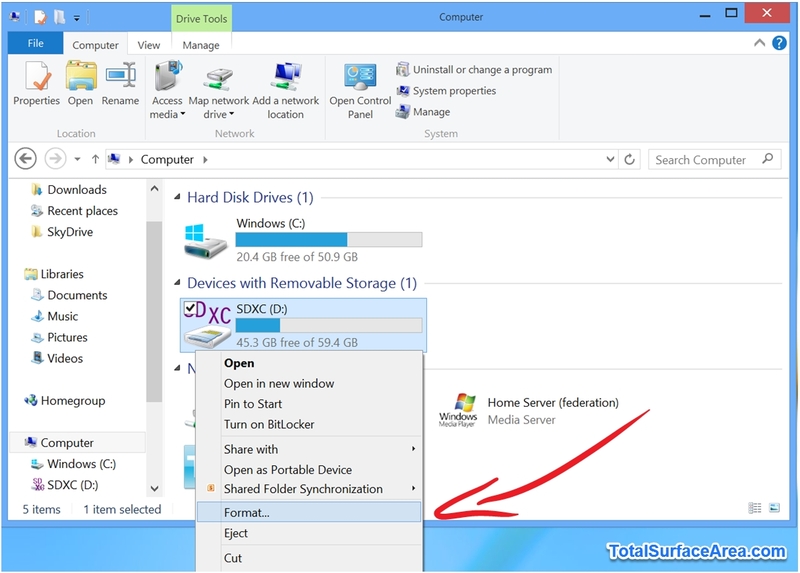 There is a way around this to get SkyDrive to synchronize to the removable media. 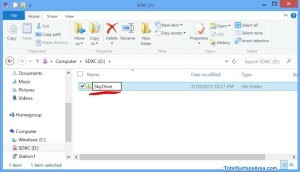 Once done, the SkyDrive desktop application synchronizes the micro SD card to SkyDrive perfectly. 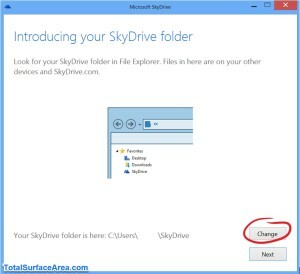 Just follow the steps below to get all the features of the SkyDrive desktop application on your removable storage. This should also work on other removable storage such as USB flash drives, Secure Digital (SD) cards, or micro SD cards, among others. 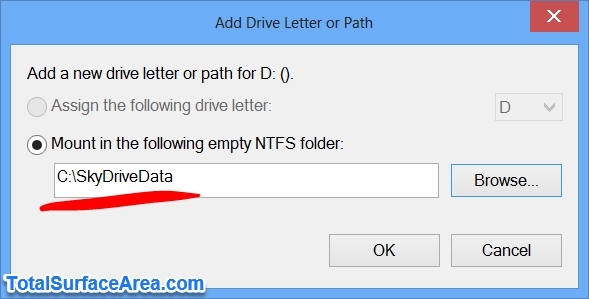 If you are a tech geek, just make sure the media is formatted as NTFS and mounted to the main drive using your preferred folders for the SkyDrive desktop application. If you are not a tech geek (yet), do not worry. I took screenshots every step of the way to make it easy to follow. Before taking the next steps, make sure you insert your micro SD card and back up anything on it that you would like to keep. 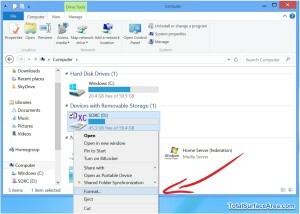 You can do this by just copying the contents from the micro SD card to your computer or an external drive. Step 1.1: From the Start screen, bring up the desktop. Your desktop should appear. 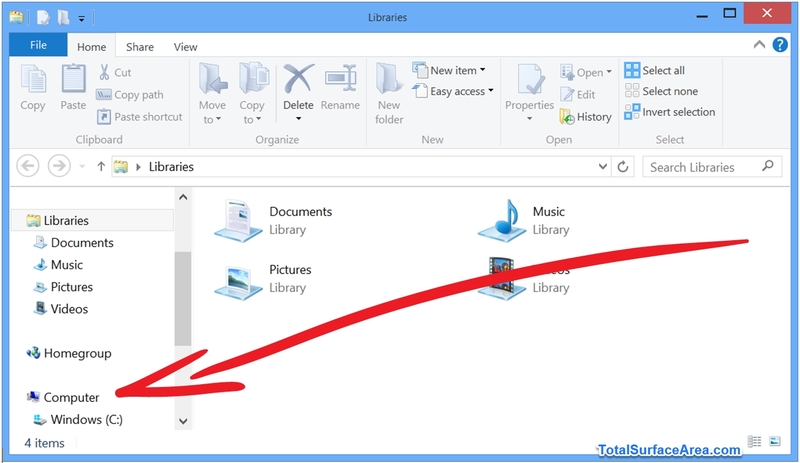 Step 1.2: Click on the Libraries folder shortcut on the taskbar. Your Libraries window should appear. Step 1.3: Click on Computer on the left panel of the window. Your computer drives should appear in the window. Step 1.4: Right click on your micro SD card on the Devices with Removable Storage category and select Format from the menu. A Format window should appear. 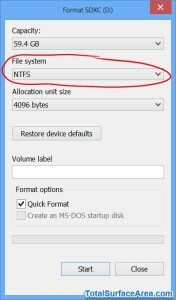 Step 1.5: Select “NTFS” as the “File system” in the Format window. Step 1.6: Click “Start”. A “Format Removable Disk” window with a warning should appear. Step 1.7: Click “OK” on the Format Removable Disk window to confirm. The format should take about a few moments. A Format Complete window should appear. Step 1.8: Click “OK” in the Format Complete window. Congratulations! You have completed formatting your micro SD card as NTFS. You are done with Step 1. 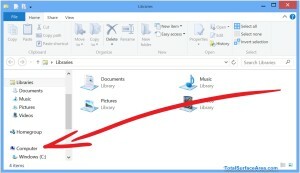 Step 2.1: From the desktop, click on the Libraries folder shortcut on the taskbar. Your Libraries window should appear. Step 2.2: Click on Computer on the left panel of the window. Your computer drives should appear in the window. Step 2.3: Double-click on your micro SD card. 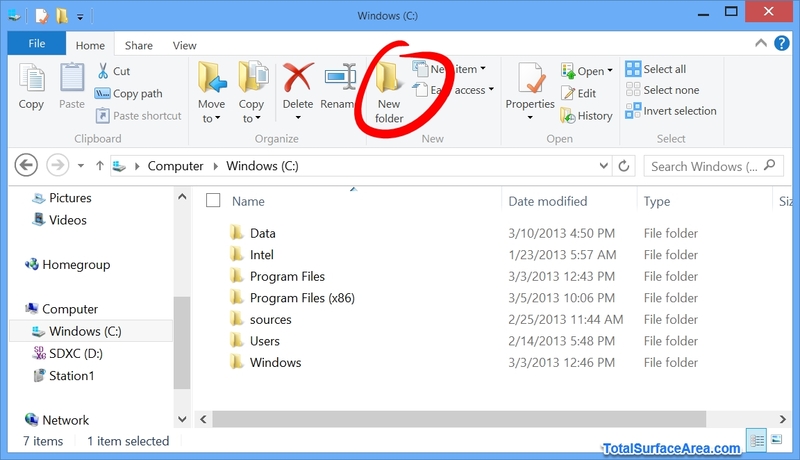 Step 2.4: Click on New folder to create a new folder. 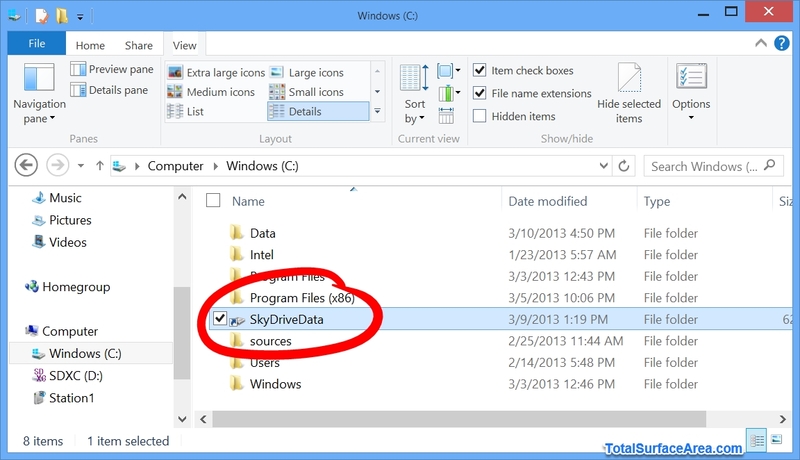 Step 2.5: Name the folder “SkyDrive”. Congratulations! 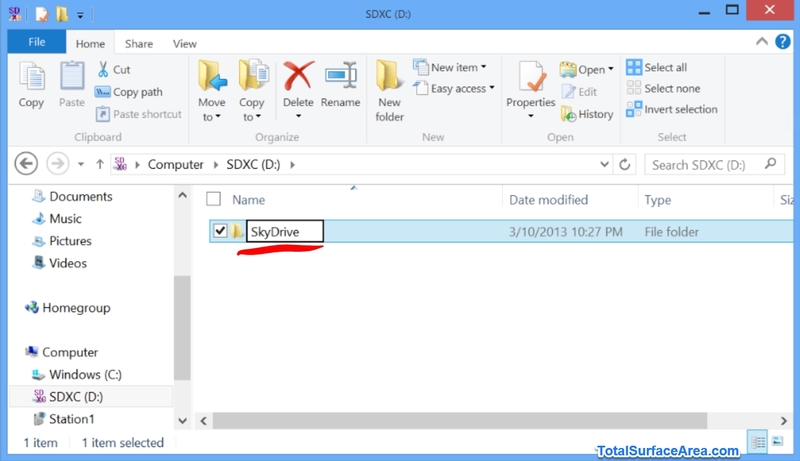 You now have a SkyDrive folder on your micro SD card, namely “D:\SkyDrive”. You are done with Step 2. 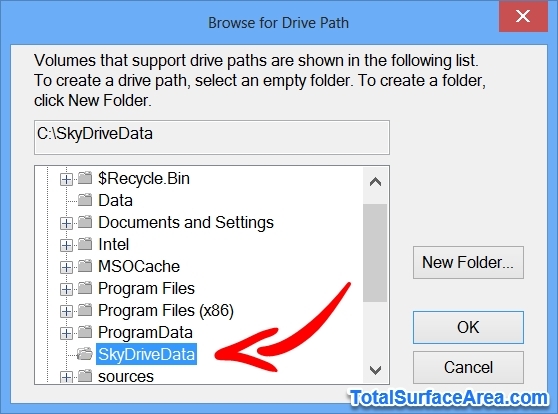 Step 3: Create a “SkyDriveData” Folder on Your Computer. 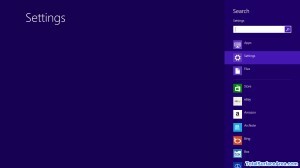 Step 3.1: From the desktop, click on the Libraries folder from the taskbar. Step 3.2: Click on Computer on the left panel of the window. Your computer drives should appear in the window. Step 3.3: Double-click on your Windows (C:) drive. 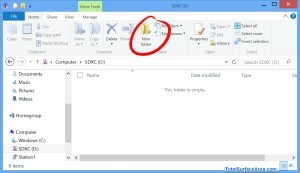 Step 3.4: Click on New folder to create a new folder. 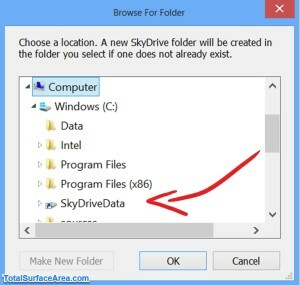 Step 3.5: Name the folder “SkyDriveData”. Congratulations! 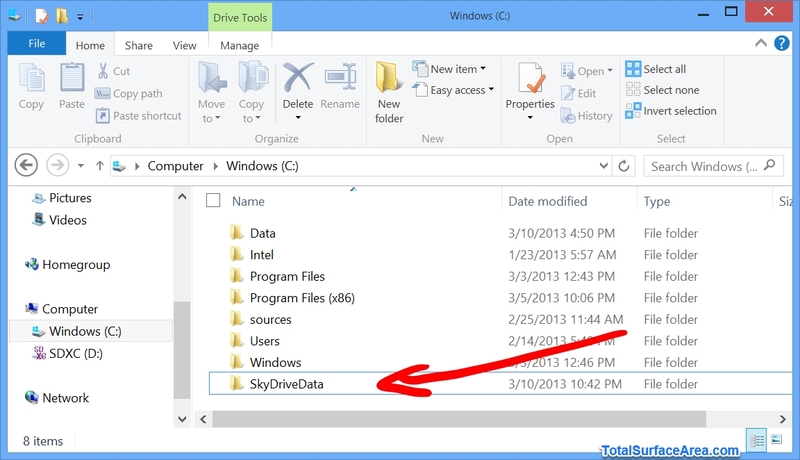 You now have a SkyDriveData folder on your Windows (C:) drive, namely “C:\SkyDriveData”. You are done with Step 3. 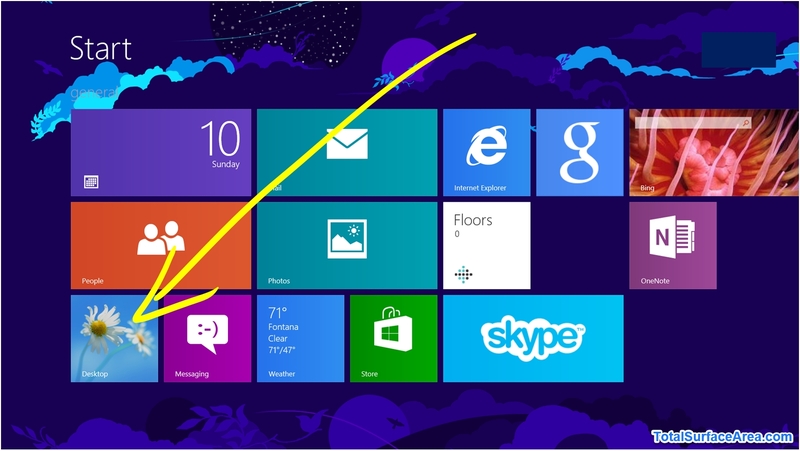 Step 4.01: From the Start screen, hold down the Windows key on your keyboard and press “W”. This should bring up the settings search screen. Step 4.02: Start typing “administrative tools”. You should see the “Administrative Tools” tile. 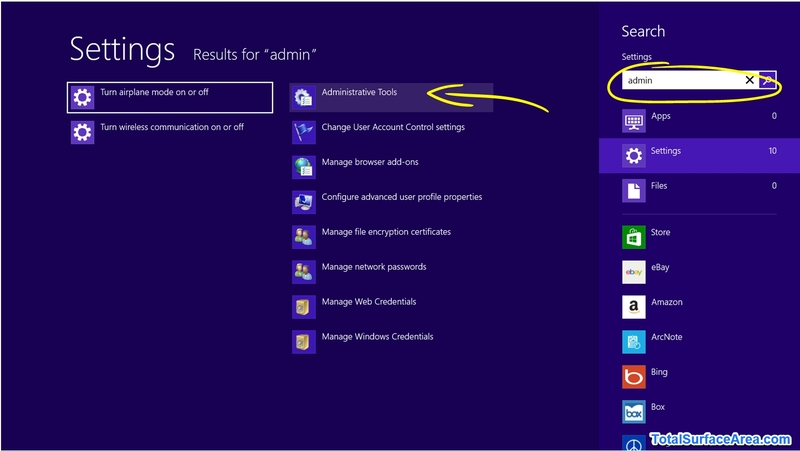 Step 4.03: Click on the “Administrative Tools” tile. This will bring up the “Administrative Tools” window. Step 4.04: Double-click on “Computer Management”. This will bring up the “Computer Management” window. 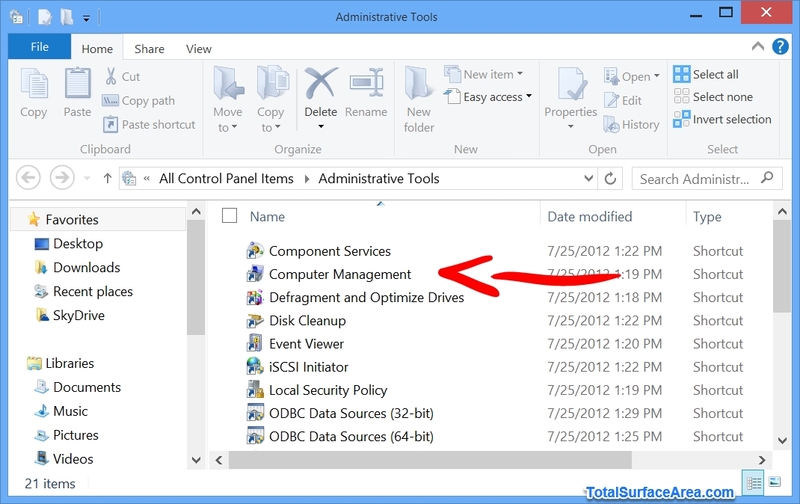 Step 4.05: Click on “Disk Management” on the left pane. You will see the center panel update to show the disks on your system. Step 4.06: Right-click on your Removable micro SD disk next to where it says “Online”. 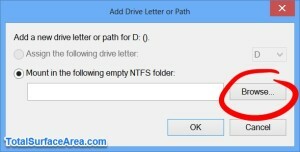 Step 4.07: Click “Change Drive Letter and Paths…”. 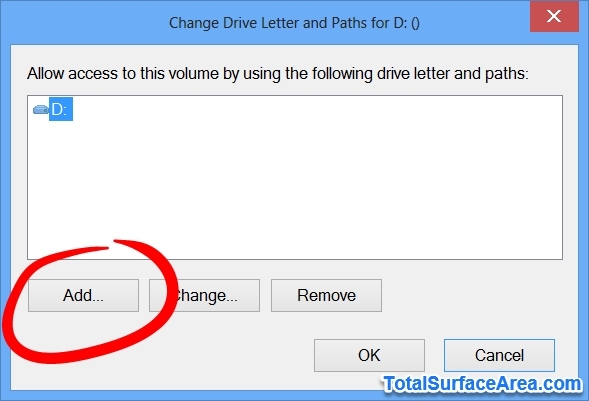 A “Change Drive Letter and Paths for D: ()” window should appear. Step 4.08: Click “Add”. 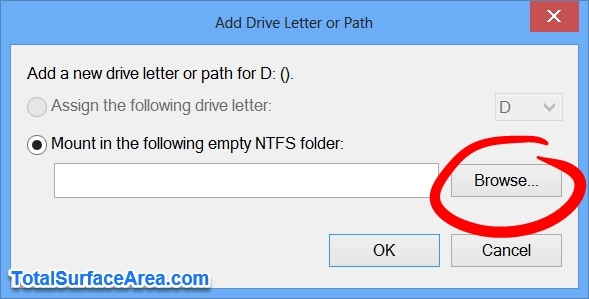 An “Add Drive Letter or Path” window should appear. The “Mount the following empty NTFS folder” should already be selected. Step 4.09: Click “Browse”. The “Browse for Drive Path” window should appear. 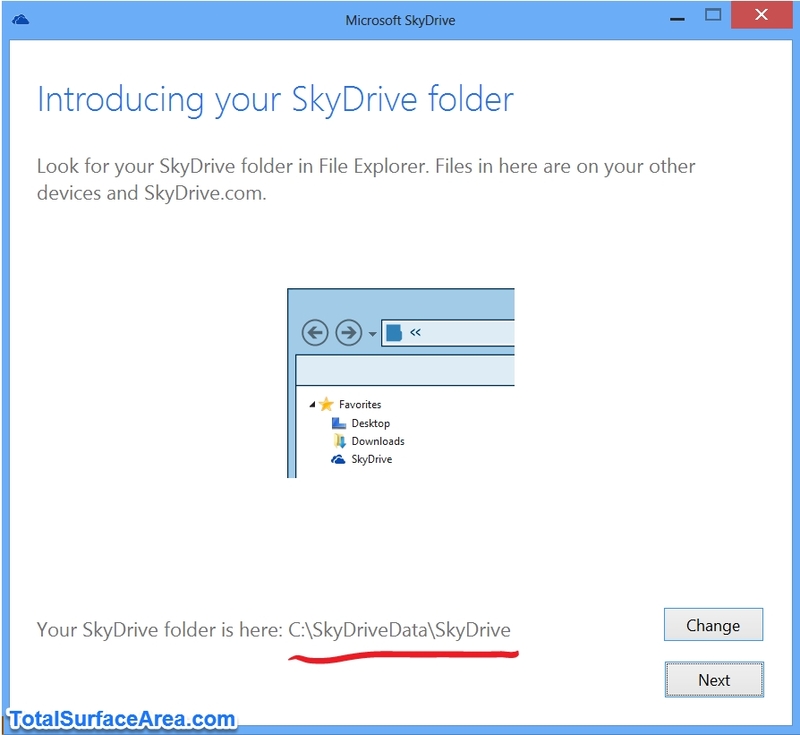 Step 4.10: Select the “C:\SkyDriveData” folder you created in Step 3 and click “OK”. You should be back at the “Add Drive Letter or Path “ window with “C:\SkyDriveData” path in the text box. Step 4.11: Click “OK”. You should be back at the “Change Drive Letter and Paths for D: ()” window. Step 4.11: Click “OK”. You should be back at the “Computer Management” window. Step 4.12: Close the “Computer Management” window. 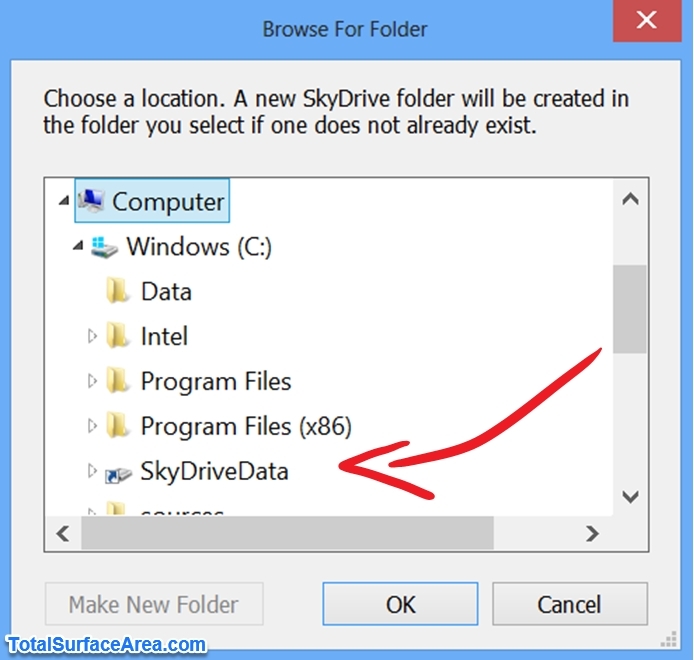 Step 4.13: Check to see if your C:\SkyDriveData folder has a new icon. Congratulations! 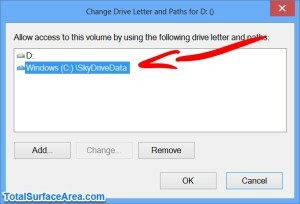 You have mounted your micro SD card as “SkyDriveData” on your computer. You are done with Step 4. 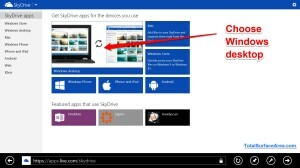 Step 5.1: Go to https://apps.live.com/skydrive to download the SkyDrive Windows desktop application. 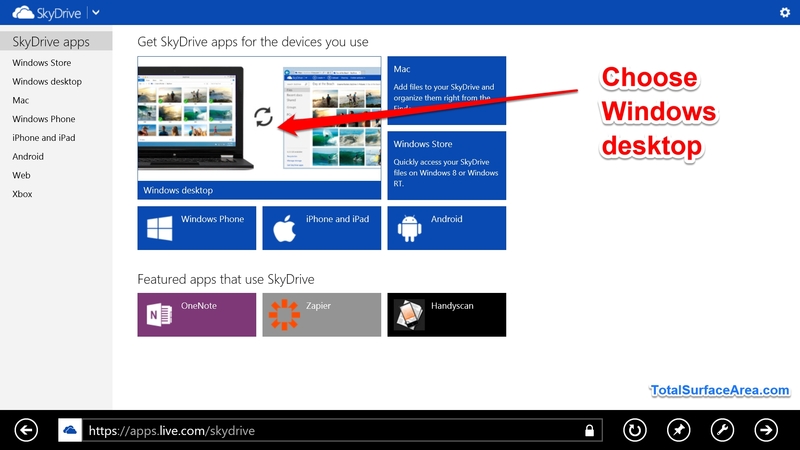 Step 5.2: Run the SkyDrive Windows desktop application installation and acknowledge the installation notice. 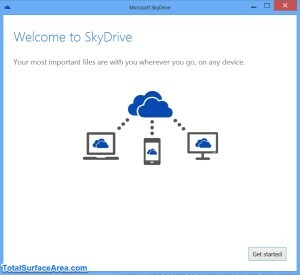 The “Welcome to SkyDrive” screen appears. Step 5.3: Click “Get started”. 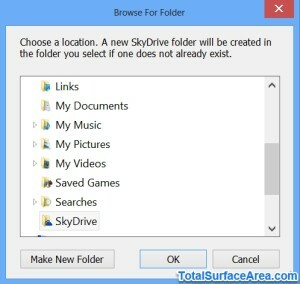 “Introducing your SkyDrive folder” should appear. Step 5.4: Click “Change”. A “Browse For Folder” window should appear. Step 5.5: Select “C:\SkyDriveData” you created in Step 3. Step 5.6: Click “OK”. You should be back at the “Introducing your SkyDrive folder”. Confirm that your SkyDrive folder is “C:\SkyDriveData\SkyDrive”. Step 5.7: Click “Next”. “Sync only what you want” should appear. Step 5.8: Click “Next”. “Fetch your files from anywhere” should appear. Congratulations! 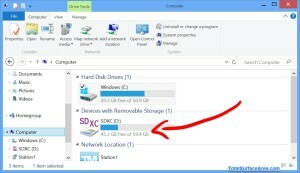 SkyDrive should be syncing all your data from SkyDrive to your micro SD card. This may take a while depending on the amount of data you have and your network connection speed. Looking for more space from your removable card, check out the new SanDisk Ultra 128GB Ultra Micro SDXC from Amazon. BTW.. tried this with a non-ntfs formatted disk and it works… yes security and features are better with NTFS, but Fat32 works too. Will there be any issue when removing the micro-SD card? In previous versions of SkyDrive/Dropbox etc I am always concerned about accidentally deleting data when the slightest things change. Thx for this perfect guide! As mentioned already, it works with an exFAT formatted SD-card as well; ExFAT should be the better FS for Flash media since apparantly it minimizes write operations to the Flash memory cells. And if you protect it with BitLocker (integrated in W8), your data on the SD card is quite safe. 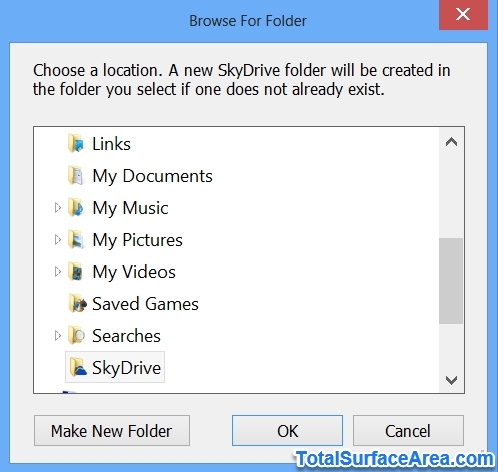 Can I have my SkyDrive folder on a NTFS-formatted microSD Card with BitLocker turned on and make the files keep syncing? Thanks for sharing with us this guide. What a fantastic walk through! Just what I was looking for. Thank you! 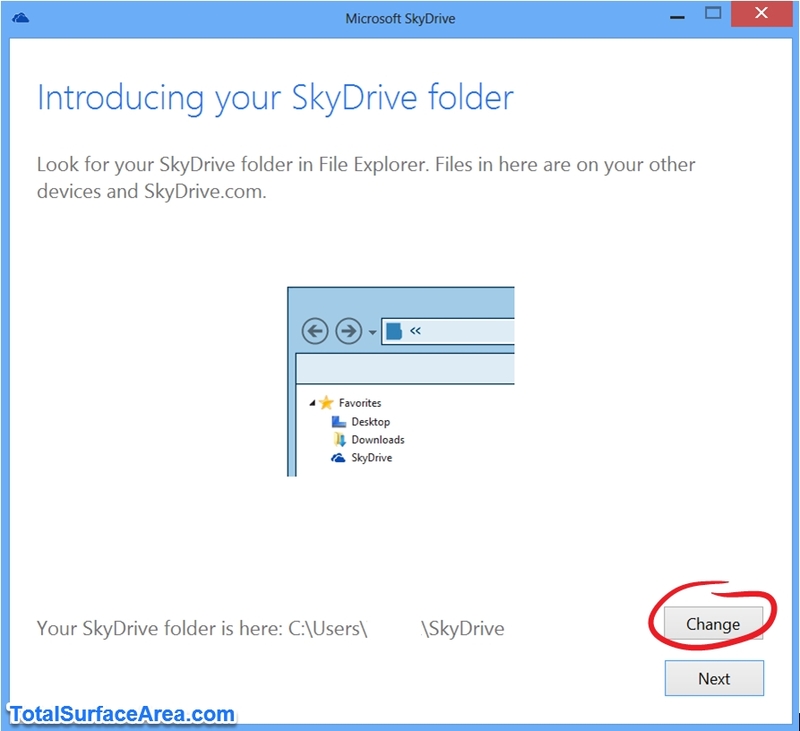 I’ve learned that the SkyDrive might delete all the data if the SD Card is not mounted, as SkyDrive would think that the files were deleted by you and remove everything from your SkyDrive. Any comments on this? I have since upgraded to Windows 8.1, with OneDrive (formally SkyDrive) integrated into Windows itself, so I am not sure if it makes a difference. 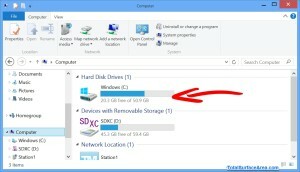 It does not sync with the SkyDrive folder on the micro SD anymore. I tried removing my microSD card and the files do not get deleted in either the micro SD card or on OneDrive. 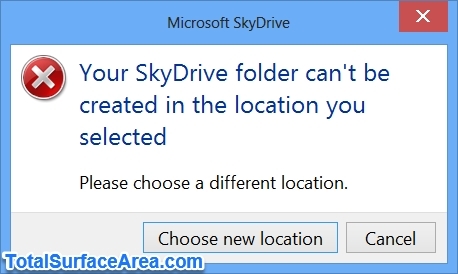 When I try to access the folder from C:\ drive, it shows a “Location is not available” dialog box. After putting the card back in, the files have not been deleted. 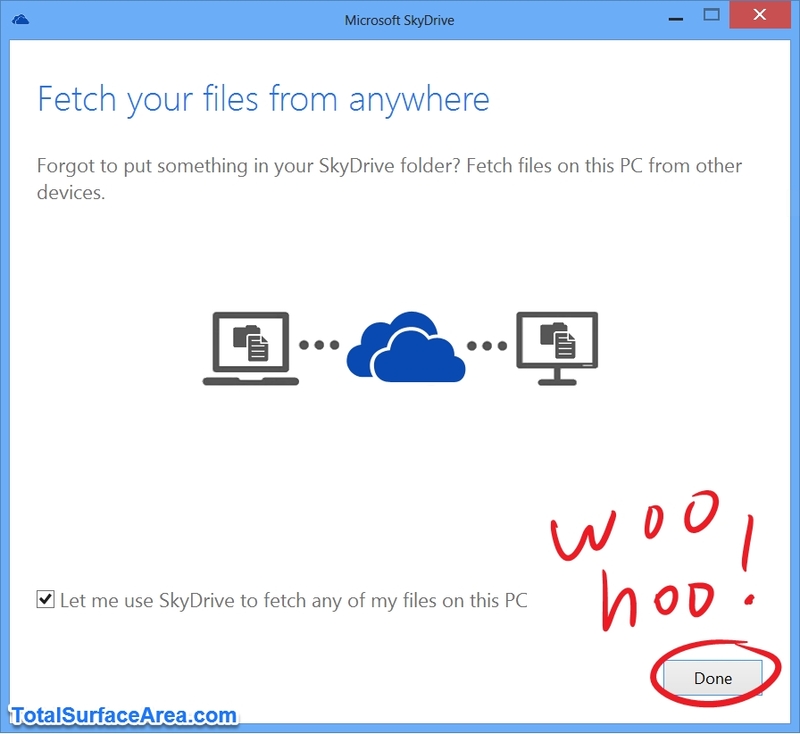 My only problem is SkyDrive does not install on Windows 8.1. The installation starts and it says installing, the progress bar completes and then the screen goes away. 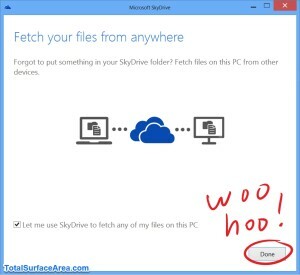 It never gets to the “Welcome to SkyDrive” screen. I tried running it as Administrator as well without success. I haven’t tried this on Windows 8.1, but believe this is because SkyDrive (now OneDrive) is integrated into Windows itself in 8.1. 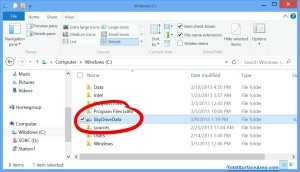 Can this be used for Skydrive pro also? 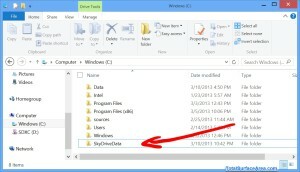 I am not sure since I don’t have experience with SkyDrive Pro. Anyone else know? I did not need to use this workaround for the built in OneDrive in Windows 8.1, just changed the location of the OneDrive folder to a folder on the SD card. Did have to use it for my OneDrive for Business (have them both on the same machine), and it worked fine for this. Hey thanks for your input on this. I followed all the steps but then Surface Pro 3 kept kicking back “cannot move to reparsed file”. Tried your straightforward way and worked perfectly!! Worked spot on for me except using windows 10 with OneDrive so created folder on SD OneDrive and the folder on c:/OneDriveDate all working fine with files syncing etc to sd card. I used a USB stick instead of a micro SD card. 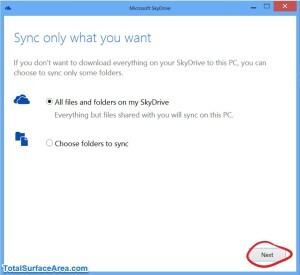 The sync between the USB stick and the onedrive account on my computer works perfectly but when i sign in on my onedrive account online the documents are from before i synced the two devices, i only ask incase i am on a different computer and forget my USB stick but need to access files, is there anyway i could get them to sync online aswell. 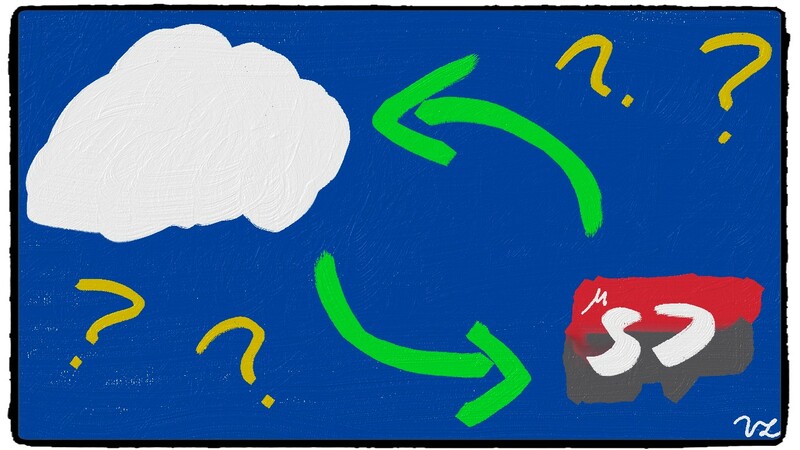 I can set up OneDrive the way you describe it and it works fine first. But when OneDrive starts to sync the folders and hits the “System Volume Information” it aborts, gives me a warning and turns off. Does anyone have the some problem and does anyone have a solution? It seems to me that it is simply impossible at the moment. Look at all the requests (=complaints in this case) in the “Windows Feedback” app related to OneDrive and placeholders and OneDrive and SD cards/external drives. I have the same issue, but that is because it is not adding to the SD card at all, but actually putting it on the C drive. I have Windows 10. How do we make sure it is only adding to the SD card. I followed the steps exactly. I created a virtual drive from my SD card, then made it a simple volume. 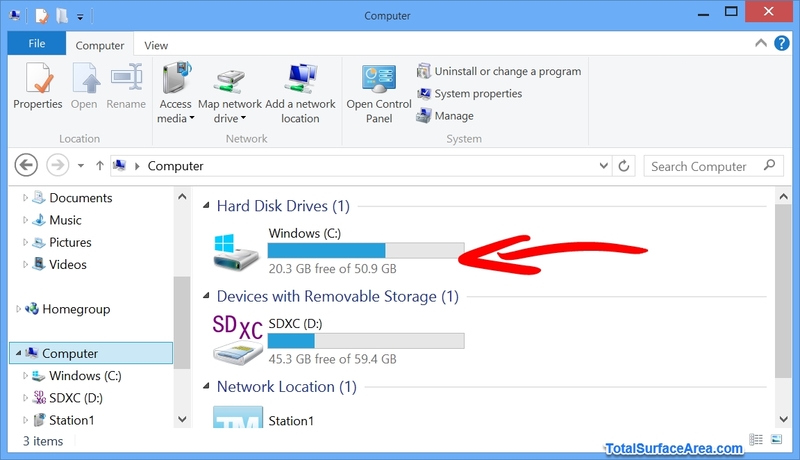 OneDrive will sync to this volume and monitor space appropriately. Speed of transfer…I have no idea? But, this works. Bloody awesome mate been scratching me head about this for a while. These instructions don’t work. Does anyone have a viable solution to this problem. Yes, I figured this out, and in a way that will not do what Dallas describes above. 1. Insert the SD card, reformat it the way it says to in the description. 2. 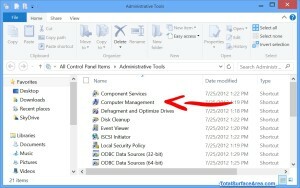 You have to right click on the word disk management in the left pane. 4. Make it dynamic, name it, and make it the size of your SD. 5. After this is done, you need to go down to this VHD, right click on it, and select initialize (left pane I think. It may be the right side, but just make sure you get an option that says initialize. 6. 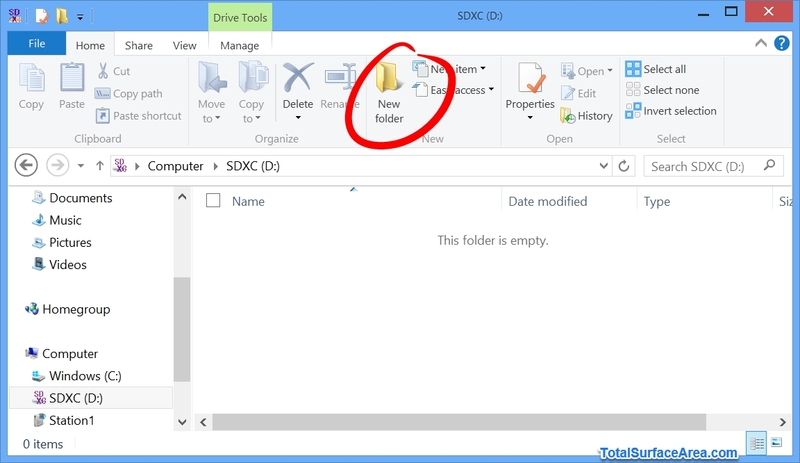 Right click on the initialized SD card which is a VHD (different color, light blue), and select new simple volume. 7. 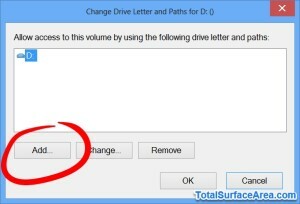 Call the volume what you want, it will get assigned a drive letter. 8. 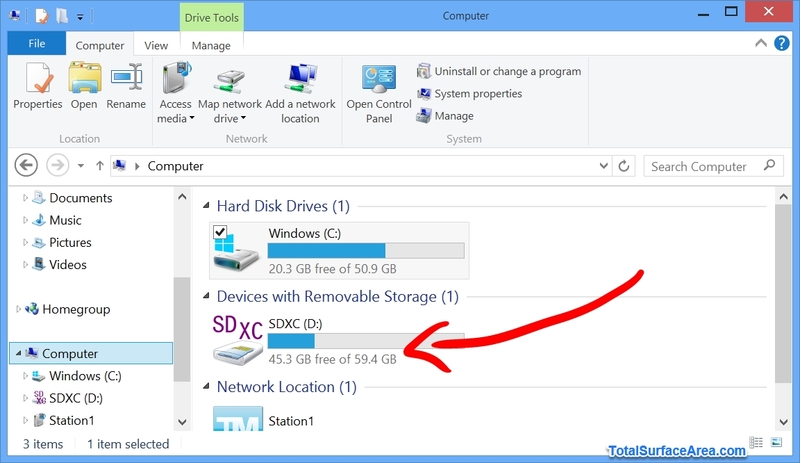 Now, unlink OneDrive, and link it to this new drive that will show up as a drive in This PC. Your SD card will also mount, so either disable that, or be aware that fact. 9. OneDrive will sync properly, and will detect the size of the correct storage amount remaining. If you need a screen recording of this, I can make one next week, just leave me a reply. If you remove the SD card, of course nothing syncs, but when you put the card back in…nothing may happen (as in the drive will not show up), but not to worry. Just open the SD card and double click on the virtual drive in it, and everything works as normal. I have been running it for several days, and everything works properly including shared document editing through Word. Actually reply to this reply (it did not take my check marks). Thanks for the tip Brian! I tried out your steps and it works great, with only a few minor quirks. I took screenshots along the way and created an updated post. Check it out here. Very clear manual for an amateur (!) and works perfectly for me on windows10 !! OneDrive now on Micro SD card an sychronised well! Brian above has a workaround. I would prefer Microsoft to have an official fix for this issue.